After relegating Ikoku Meiro no Croisee to batch status (there's just not enough to talk about...), and with Kamisama no Memochou not airing this week (since the first episode was double-sized), I seem to have a lot of time this week. But that just means next week will be terrible. 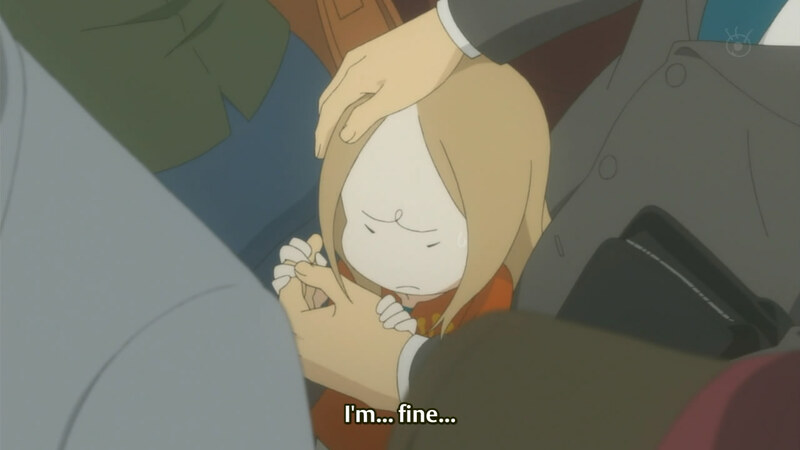 With this episode marking the beginning of Daikichi and Rin's new life together, there was a constant feeling of Aishiteruze Baby but with a twist, since it was literally just the two of them (and Daikichi has lots of adults worries, which Kippei didn't have to deal with). There wasn't a lot of growth this episode, except for the two getting used to each other (although Rin seemed pretty taken with her new caretaker from the very beginning of the episode anyway). There were lots of hints as to changes that may occur very quickly; at the end of the episode, Daikichi seemed to have resolved to give up smoking, and it became pretty obvious that his current style of working was not going to cut it. Ah, children. You just want to kill them. 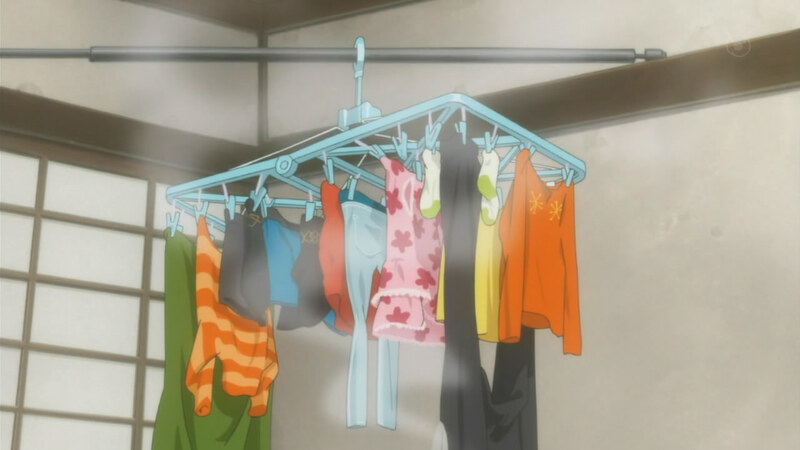 The episode began with Daikichi and Rin heading out to go shopping for the things that she would need (futon, clothes, shoes, and a toothbrush, as the list a few seconds in revealed). 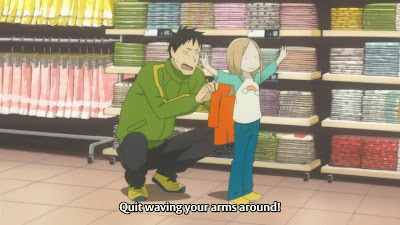 Daikichi's interactions with Rin here was pretty sweet; he behaved with her as he would behave with a peer, and thus managed to chastise her whenever she did things that he didn't like (such as disappear suddenly as they were walking down the street). I like his brand of "parenting". 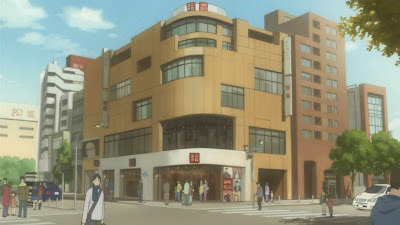 I wonder if Uniqlo actually gave some money to the producers or something; that's a pretty big advertisement to do. I may not have noticed this had I not been in Beijing last summer; Uniqlo is a very big Japanese brand. While I didn't go last year, I was a little excited to go this year, since they seemed to be so popular. I was grossly disappointed. They seem to be a type of Old Navy, which I have in droves back in Toronto. For both men and women, the clothes are uninspired and slightly bland. The t-shirts were pretty annoying, sporting generally carebear (wow, when did I last use that term?) slogans, such as, "It's one planet. We are all interconnected. My heart is with you. Ganbatte," and, "Mickey knows a smile will always help when things get tough." The first one I can forgive, as it seemed to be a part of the relief fund after the earthquake. The second one was just tripe. I just don't like shirts like that that don't seem to have a punchline; rather, they're clearly either quoting a famous line or presenting some feel-good material. That's pretty uninspired; clothes are more important than that. I did like one, but not in the "want to wear" way: "Just when the caterpillar thought the world was over, it became a butterfly." This is pretty much what happens when Rho and I go shopping. 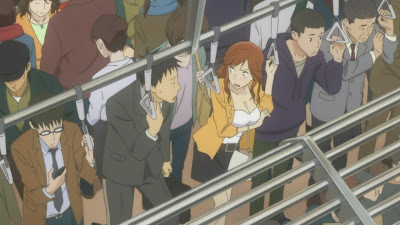 After their return with all of the new wares, Daikichi got to work on figuring out where to send Rin during the daytime. He seemed to have taken a day off from work, since it was Monday, and Rin's comment that skirts were not allowed at nursery reminded him that she couldn't just stay at home all day. He called his cousin, Haruko (mother of the every-annoying Reina), who seemed to clearly have some awkwardness in her house. While she was cooking (shrimp tempura~), the phone rang and she didn't seem to have enough voice to ask her mother-in-law (watching TV) to answer it. 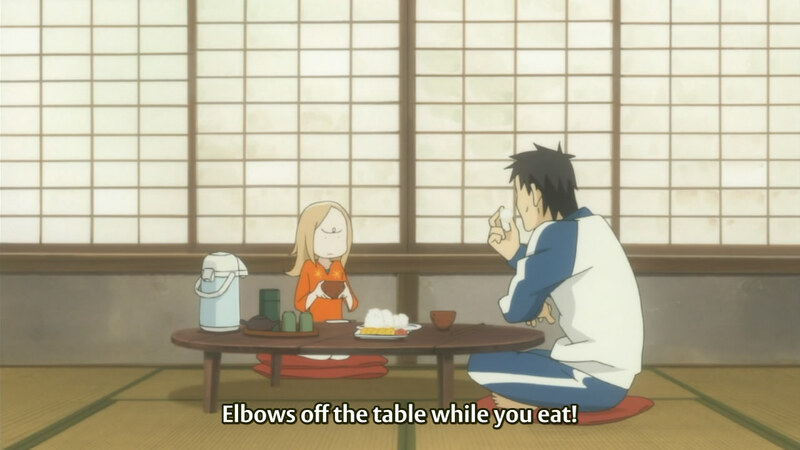 The woman did anyway, and then passed the phone to Haruko (and, while she was talking on the phone, her mother-in-law seemed to be watching the food in the kitchen). It was just a strange feeling I had; the family did not seem to function seamlessly. Rather, it did actually seem like a few strangers thrown together. No children during rush hour? After getting some help from Haruko and finding out about the emergency nurseries, Daikichi began the next day with a proper breakfast (damn, it made me hungry for some reason). His predicament was slightly funny; not only dis his commute time double due to taking Rin to her nursery, but travelling on the trains during rush hour is hard enough for a grown man as is. I wonder if this will be resolved somehow; does Daikichi have the money to buy a car? Or maybe he'll make friends with other mothers. Or maybe he'll find a new job. So many questions! While Daikichi worked hard during the day, Rin seemed to fit in with the other children just fine. As the day began winding down, the other children slowly began leaving one by one, until only Rin and another girl were left. Of course, due to Daikichi's super-devotion to working, the other girl was picked up and Rin spent quite a long time playing by herself. Afterwards, the nursery actually had to call Daikichi to remind him to pick up Rin, and then she sat outside with one of the teachers while waiting for him. 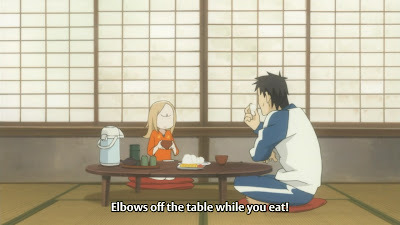 In typical cutesy-style, she was initially annoyed that he was so late (but, interestingly enough, it didn't seem like she didn't understand), but then became immediately happy (and forgave him) after he apologized (by "eating a thousand needles" for breaking his promise). The smell of smoke is ridiculously hard to get rid of. The next few days were covered much faster. 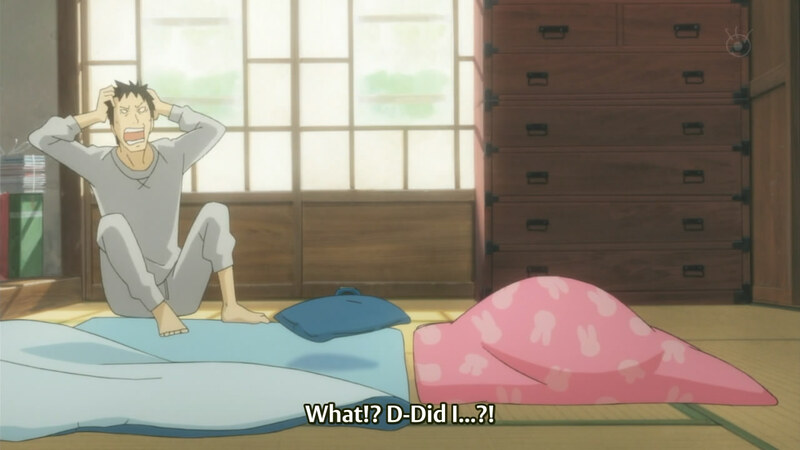 Daikichi was woken up the next morning by an excited Rin, and they followed the same routine. 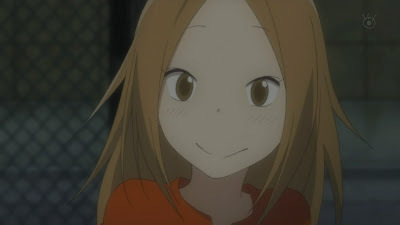 Daikichi attempted to do his work faster (and seemed to almost forget certain things), and Rin continued to interact with her classmates (although, since none of them were introduced, I don't think they'll be important). On what I assume was the third day, Daikichi's boss (or perhaps another co-worker) came to him to note that he missed a shipment the previous day, causing Daikichi to be very apologetic and also reflect on the difficulty of the lifestyle (and also look into the baby book, foreshadowing that he would be attempting to find Rin's mother). The difficult schedule was obviously also taking its toll on Rin, who almost fell asleep several times on their walk home at night. A grown man wetting the bed is definitely cause for concern. After the ED, there was a simple scene of one morning Daikichi waking up by himself to find that Rin was in her own futon. Considering that she always slept next to him, he was surprised - until he found the puddle in his bed, where Rin usually was. She was adamant that it was just sweat, and he went along with it. I wonder if this will be another plot point later on? Children who suddenly wet their bed are usually pushed to it subconsciously by other factors, such as stress or worry. 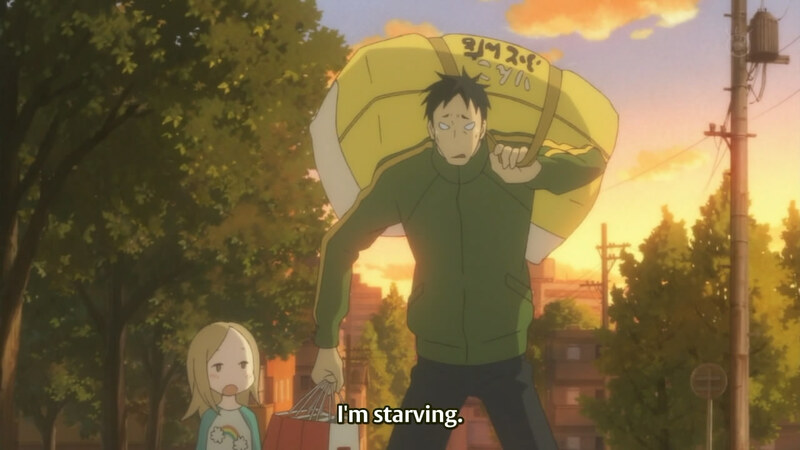 All in all, the pacing of this anime is so far pretty acceptable. There were many possible plot points introduced in this episode, though I think maybe some of them I'm just looking too deeply into. I wonder what Rin's mother will be like, once Daikichi finds her; in Aizhiteruze Baby, Yuzuyu was always talking about her mother and it was very clear that she would return to her care on day, whereas here Rin never talks about her. Having another anime to so closely compare it to really helps with understanding where the story is going; I think Rin and Daikichi will probably stay together for a long time with this one.